Is AT&T Inc. a Buy? Iconic phone company AT&T is making big bets, but do these aggressive moves make it a buy? AT&T, Inc. (NYSE:T) is unloved on Wall Street, with the stock down by roughly a third since early 2016. That, however, has pushed the yield up over 7%, more than three times what you'd get from owning an S&P 500 Index fund. Is this out-of-favor telecom giant a buy as it expands into new spaces? The AT&T of today isn't the same as the one that existed 100 years ago. The government broke that company up in the 1980s, forcing it to spin off the so-called Baby Bells. Although a bit of a simplification, the Baby Bells owned the local phone side of the business while AT&T was left with the long distance side. That wasn't enough to keep AT&T going, as competition and technology quickly eroded margins in the space. AT&T tried to turn things around, but in the end, SBC, one of the Baby Bells, ended up buying the company in 2005 and taking its name. Today's AT&T is not the AT&T of old -- it is SBC under a different name. Using the AT&T name, however, was clearly the right move for SBC. And the acquisition aided the telecom in its transition away from copper telephone lines as it worked to become one of the largest cellular-phone companies in the United States. It's only major rival at this point is Verizon Communications (NYSE:VZ). However, smaller rivals are using aggressive pricing to attract customers and forcing their larger brethren to compete on price. AT&T's cellphone business still is desirable, but growth prospects are muted. The market is largely saturated, there's another round of capital spending on tap as the industry switches to 5G service, and gaining and maintaining market share is a fierce daily battle. This is part of the reason why AT&T purchased DirecTV in 2015 in a nearly $50 billion transaction. The idea was pretty logical: DirecTV owned a system (satellites in this case) with which people connected to visual content -- roughly similar to the way a cellphone connects people to video, the internet, and each other. The problem with the purchase is that customers are increasingly opting to cut video services like DirecTV in favor of streaming content provided by companies like Netflix and Amazon (through its Prime service). That choice on the part of customers is backed by the fact that they can acquire content in ways that were unavailable before (notably on their cellphones). This is an obvious statement, but it underscores the reason why AT&T purchased Time Warner for $110 billion in 2018. That gave AT&T control of media assets like HBO and Warner Brothers. Now, AT&T controls key ways in which customers connect to highly valued content. The goal is to provide that content in a way that keeps customers under the the AT&T umbrella. The only problem here is that streaming providers, notably Netflix and Amazon, are increasingly focused on creating original content, potentially reducing the value of the content AT&T just spent so much to buy. None of this is to suggest that AT&T is making poor choices, per se, only that it owns a collection of businesses that are all facing some sort of headwind. And while the content push is still early, it has a better shot at success than Verizon's attempt to turn internet has-beens Yahoo! and AOL into a successful media operation. Verizon, for reference, just wrote down the value of those assets by $4.6 Billion, effectively conceding defeat on the idea of being a content company. Still, the steep price decline in AT&T's stock clearly shows that investors aren't convinced that the company is on the right path. And the evidence so far isn't conclusive. For example, revenues were up 15% year over year in the third quarter, but that was largely because of the Time Warner acquisition. The legacy businesses are, effectively, just holding their own. It's understandable that investors are taking a "show me" attitude, basically waiting for AT&T to prove that adding media to the mix can truly increase the value of its other offerings. At this point, investors interested in growth should probably follow the crowd on this one and sit on the sidelines. Income investors, however, are likely to find the 7% yield fairly enticing. Add in a 34-year history of annual dividend increases -- much of that history built under the SBC name -- and there's even more allure here. A dividend focus shifts the equation a little, with the big question being dividend sustainability, not growth. On that front, AT&T continues to generate significant amounts of cash, with roughly $6.5 billion in free cash flow in the third quarter. Dividends only totaled around $3.6 billion, so there appears to be plenty of room to support the shareholder payment. There might even be room to grow it, though dividend growth will have to compete with debt repayment -- long-term debt was higher by roughly 33% year over year in the third quarter and management has been looking to bring that total down. All of that being said, if you're an income investor looking at AT&T's 7% yield, it looks pretty sustainable today. 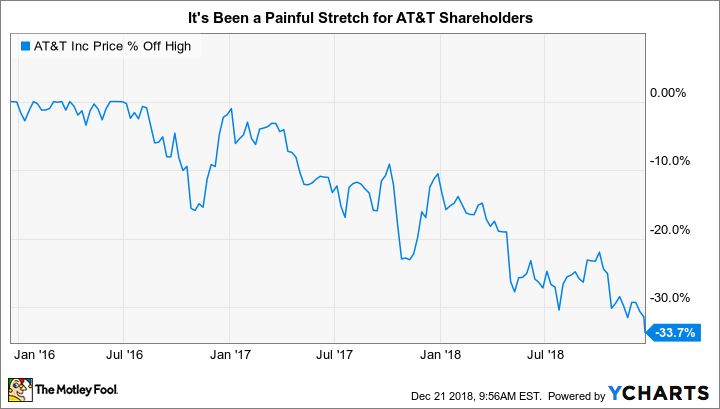 But AT&T is navigating a fast-changing industry landscape and falling behind the curve could pose a long-term problem to the dividend. And so far, none of its changes appear to be slam-dunk successes. In other words, dividend investors need to keep growth in mind, too, even though dividends are the goal. Simply put, if AT&T isn't successful at changing with the times, it won't be able to keep paying the dividend over the long term. All in, there are better income options out there today that aren't facing these types of headwinds. That said, if you still are enticed to buy some AT&T to boost the cash your portfolio generates, just make sure to keep an eye on its growth plans even if you're an income-focused investor. Check out the latest AT&T and Verizon earnings call transcripts.